Yes, I am busy, but I have no time for sewing or creating. I am really missing it this week. Thank goodness my loom should arrive tomorrow. I hope to do some practice weaving on it this long weekend. I am getting a Kromski Harp Loom that is 24" wide. I have "borrowed" this picture from the company. I hope they don't mind. I am totally excited about getting this loom. 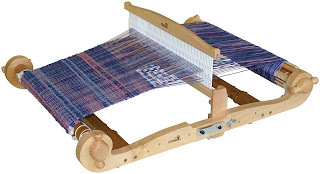 It is what is known as a rigid heddle loom. That part in the middle that the threads go through is the heddle. The cool thing about this loom is that it can be folded in half for easy storage - even if you are in the midst of a project. That is a huge plus for me since I have limited space and may be moving into an even smaller space when I retire. If I do good with my weaving I hope to put some woven items in my Etsy shop. Right now all I have are note cards there. And just for entertainment, here is one of my paintings for your enjoyment. This is available printed on notecards. Just ask here or convo me on Etsy at my Etsy shop. I can add a listing for you. Very cool! I can't wait to see what kind of lovely art you create with your new loom! Gene, I'm excited for you to start creating with your new loom, and I can't wait for your impressions of The loom itself. where did you get it? I love weaving! My hands like it too:). It's not hard on them at all. One question about the box loom, no matter how hard I try to keep the weave loose, the sides want to curve towards the middle. Will that straighten out a bit when the piece is removed from the loom? Weaving is so creatively fulfilling! I can't wait to see what you create with your new loom Gene! That is something I have always wanted to try and I didn't know there was one that folded up with your work on it. Yeah! to the loom. I am glad I finally found someone who has interests along with quilting. I've never been able to hold my attention to just one thing. There are so many things that have beautiful endings and I have always wanted to try them all! I told you I bought into a flock of sheep to do sheep to shawl. We use Gilmore floor looms. You are going to love weaving. Next I expect to hear that you are leaning to dye yarns! Looking forward to what you create with your loom. It is something I've always about. It's neat to that it can fold into a smaller loom! The loom looks interesting. I can't wait to see what you create with that. 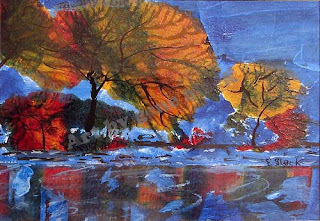 And I enjoyed the painting too, the reflection on the water is lovely. I'm off to visit your Etsy shop. Have a super day! Glad to hear you found a loom! I look forward to seeing what you will create with it!